I am reviewing both here as these are the ones I use, however it is also available for Android. 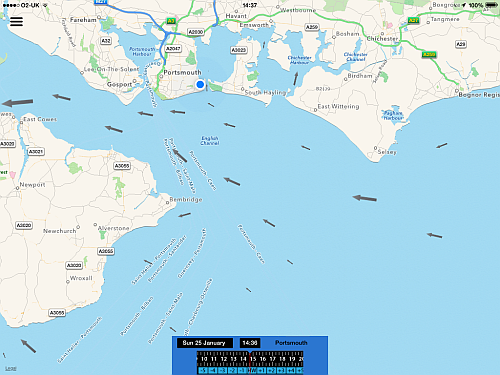 The Boatie app has been around a while but the new version released in January 2015 is almost like a brand new application. 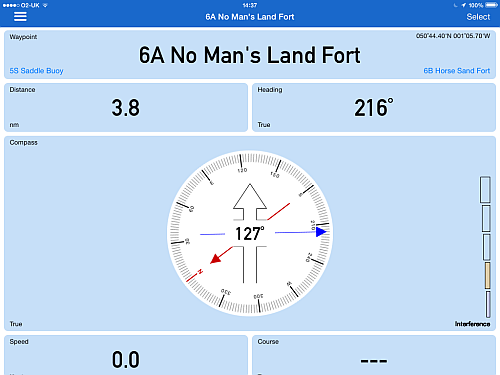 Although it is only a low cost app, it functions as a tide and weather reference, a compass, GPS navigator and even has a comprehensive visual database of the Rules of the Road. 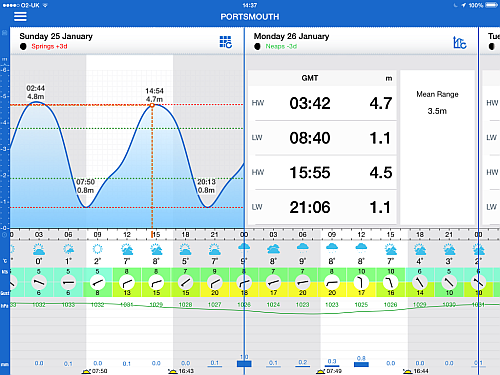 When you first open the App it takes you straight to the Tide and Weather page. The menu button is top left. 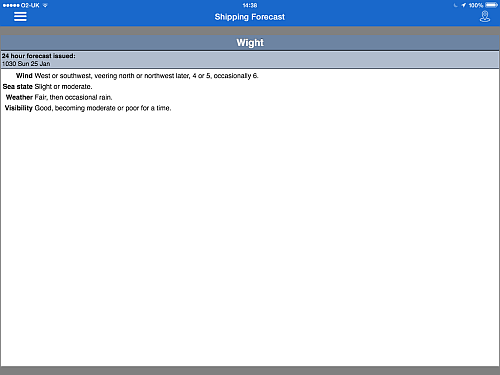 This page shows the tide times and height hour by hour, and below is the local forecast showing wind speed, gust, direction, temperature, cloud and barometric pressure. The Tidal Streams show the direction and strength of tidal currents, and has an interactive slider bar at the bottom to show how this changes hour by hour. Note the GPS is active,the blue dot shows I am in Southsea Marina! 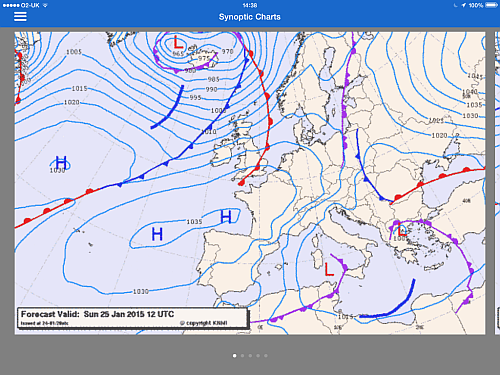 Further weather information is available in the form of the current Shipping Forecast, Inshore Forecast and Synoptic Chart. 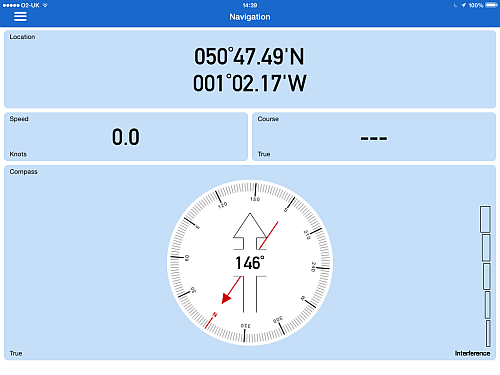 The Navigation pages are a combination of compass and GPS tracker (but not a chart plotter). This shows a position, course and speed. Note the bar on the right showing the level of interference with the compass. In this case it is looking pretty good! As I type in my sitting room, the bar is looking very red. There are some Waypoints that are supplied with the app, and you can upload your own. This example shows distance and heading from Southsea to No Mans land Fort, and would show course and speed if I was moving. 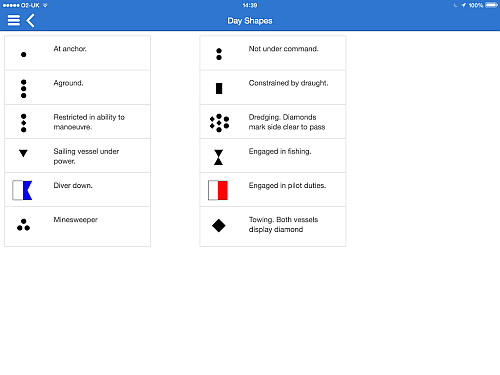 The Reference section is a wealth of information covering Rules of the Road, weather, VHF radio and navigation. This is just an example, this section is exceptionally rich in information. There is very helpful “Usage Tips” showing additional features that may not be obvious. There are many more features that appears by tapping and swiping so it pays to experiment. 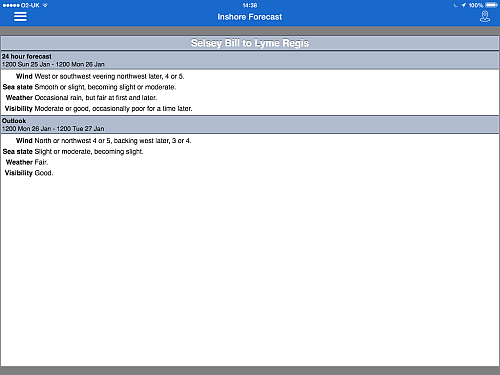 The database can only be updated if you are within range of WiFi or phone signal, but once updated the app is self-contained so it is a very useful boating aid. For the price, it is exceptionally good and I would give it five stars!